Bioeconomy Developments Blog > Blog List > Agriculture > How can CHOGM start a Green Revolution in Sub-Saharan Africa? First step: address under-investment in agricultural research and development. (Image: AAP). Green Revolution: More pragmatic approaches to solving Africa’s food security problems are needed. CHOGM: As the leaders of Commonwealth nations meet in Perth, The Conversation is examining the role of the biennial Commonwealth Heads of Government (CHOGM) Meeting. Daniel Rodriguez from the University of Queensland argues more pragmatic approaches to solving Africa’s food security problems are needed. In its Theme Paper, this year’s CHOGM meeting declares its commitment to addressing issues of food security in Africa. This is the first in a series of articles by The Conversation Africa, on the topics of fertiliser, crop production, soil health, etc. The Conversation Africa, launched in May 2015 as a pilot project, is an independent source of news and views from the academic and research community, delivered direct to the public (See theconversation.com). To address this issue, CHOGM will need to be armed with evidence. So what do we know about how best to feed Africa’s hungry? A quarter of the 925 million-undernourished people around the globe live in Sub-Saharan Africa (SSA). In SSA, agriculture directly contributes to 34% of GDP, 64% of employment, and 20% of the exports. This makes the growth of the agriculture sector two to four times more effective in reducing poverty than growth of any other sector. Increasing agriculture’s output is a great opportunity to promote economic development in some of the most food insecure and vulnerable countries in the world, and most important it is also achievable. Until the late 1980s, sustained investments in agricultural development – from the World Bank, the US government, the European Community and the UK Department for International Development, among others – achieved growth rates in food production above the population growth rate. During the following three decades, Official Development Assistance (ODA) investments in agriculture dropped from US$6.2 billion in 1980, to US$2.3 billion in 2002. In addition, national support for agriculture research and development in developing countries declined by half compared to the 1980s. Up to 83% of the developing world’s investment in agriculture takes place in only three countries: Brazil, India and China. Clearly one of the reasons underpinning the recent food crisis has been the under-investment in agricultural research and development in the developing world. Reducing food insecurities and poverty in SSA will require rather different approaches to those used in the irrigated and better market-connected Asian rice and wheat farming systems. In SSA, 96% of the agriculture is rain fed. Climate is highly variable, soils are badly depleted of nutrients and farmers mostly use manual labour. Infrastructures and access to input and output markets are very limited or non-existent. 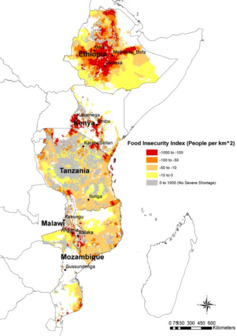 Given all these constraints – human, social, financial, physical, natural; the diversity of agro-ecologies, socio-economic conditions, and cultural and religion backgrounds – solving SSA’s food security remains a stubborn “wicked problem”. “Wicked problems” are problems that defy conventional methods of enquiry. They can’t be solved by the blanket approaches commonly preached “dogmatically” by many development agencies. Nor will they be beaten by donors investing in simple – miracle – solutions to a very complex problem. The challenge for policy makers, donors and scientists is to embrace more complicated modes of inquiry. These should include working across disciplines with farmers to define the research question, and jointly learn and experiment with more relevant and actionable innovations. Together with the right combination of policies, increased investments in agricultural research and development, and the strengthening of markets and infrastructure this could generate the economic incentives people need to change the presently low input-low output African agricultural system. In SSA, soil fertility is highly exhausted. But the use of inorganic fertilisers is minimal. Farmers apply about 10 kg/ha of fertilizer in Africa, compared to 86 kg/ha in Latin America, 104 kg/ha in South Asia, and 142 kg/ha in Southeast Asia. Alternatives to the use of artificial fertilisers are being explored. The Gates funded project N2Africa is helpping smallholder farmers adopt nitrogen fixing technologies using legumes crops and more effective bacterial seed inoculants. 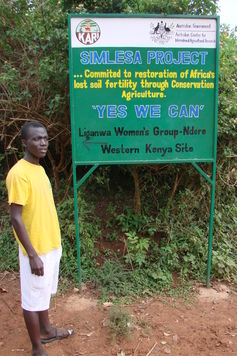 The Evergreen Agriculture program combines nitrogen “fertilising trees” such as Faidherbia with crops in agro-forestry systems to provide food and nutrients into highly depleted soils. These approaches would provide one of the required nutrients, nitrogen. But phosphorus, potassium, and most micro-nutrients would still have to be imported into the system. However, technologies shouldn’t be considered in isolation from the realities of farmers’ lives. Making biological nitrogen fixation work when farmers can’t get quality seeds at the right time or in the right place; or having farmers plant trees and wait up to 15 years for the trees to grow, might seem too much to ask. Australia’s $20M ACIAR funded project SIMLESA is taking an alternative approach. SIMLESA is working in Ethiopia, Kenya, Tanzania, Malawi and Mozambique. The objective is to increase maize yields by 30% and reduce risks by 30% across 500,000 households over the next 10 years. capacity building by providing short training courses, MSc and PhD training for African Nationals. promote the use of climate information and seasonal climate forecasting tools to inform actionable farmer’s decisions. No “silver bullet” approach or promotion of un-proven pseudo-science-based alternatives to the modern sustainable intensification of agriculture will create an African “Green Revolution”. Instead, human, social and policy transformations are required. In the particular case of Africa the paradigm should be “doing more with more”, not “more with less” as suggested elsewhere.